This is a hot favourite among the children at home. On the days when my grey cells are too tired and refuse to budge, I take the help of my grandchildren to plan the menu, and their unanimous choice would be carrot and peanut sambar. No roasting, no grinding and no slogging. The quick method is to just set a pressure cooker with the dal, vegetables, and rice in the three separators and then relax. A nutritious, pleasant looking and mouth watering sambar, along with steaming hot rice will be ready in less than half an hour. 1.Soak peanuts in hot water and set aside. 2.Wash the tur dal well. Add ¼ tsp of turmeric powder and 3 cups of water and set it in one separator of the pressure cooker. 3.Peel, slice and arrange carrot slices in another separator. Don’t add water, as the steam in the cooker is enough to cook the carrots. 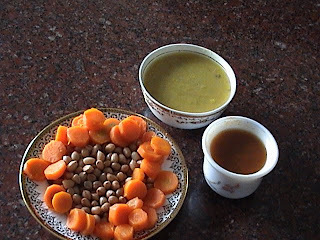 4.Take a small steel cup with water and drop the tamarind and sambar powder into it, and place it beside the carrots. 5.Now arrange the separators in the pressure cooker. Add an inch of water at the bottom of the cooker. Place separator containing rice and water first. This is optional in case you want to make rice. 6.In the second separator, place the dal and turmeric mixture. Finally place the separator with carrots, and the cup with tamarind and sambar powder. 7.Close the lid. Pressure cook until 3 whistles on a high flame and then switch off the flame. 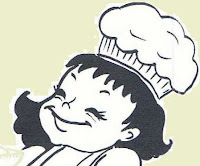 8.Do not open the cooker now, as the cooking process continues until the cools down. Once the cooker has cooled down (takes about 10 minutes) it is ready to open. 9.Now heat 1 tsp oil in a vessel, and add asafoetida and mustard seeds. When the mustard splutters, add the fenugreek seeds and roast till it becomes red in colour. 10.Next add the broken red chillies and fry till crisp. 12.Now remove the carrots and dal from the cooker and add to this seasoning. 13.Drain the peanuts and add it to the dal as well. 14.The tamarind and sambar powder would have dissolved in the cup of water. Squeeze out the tamarind seeds and fiber and discard. You will be left with a thick mixture of tamarind juice and sambar powder. Add this to the dal as well. 15.Stir all the ingredients till well blended, and boil for a few minutes. 16.Make a paste with rice flour and a little water and add it to the sambar and boil for 2 or 3 more minutes. 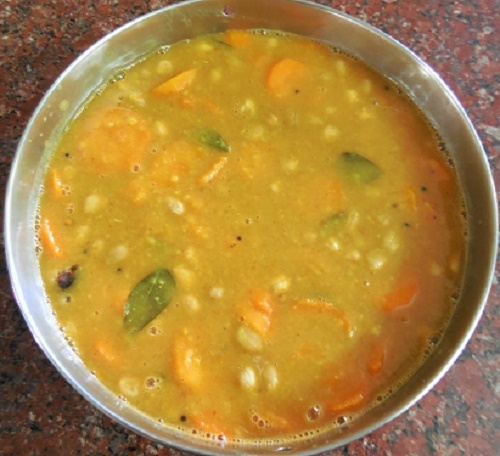 This step is optional, and can be done if you want to thicken the consistency of sambar. 17.Garnish with fresh coriander leaves and serve it with the steaming hot rice. A spoonful of ghee will enhance the flavor. In case you do not have a pressure cooker you can still make sambar in a large heavy bottomed vessel. Boil dal and turmeric till soft and set aside. Soak tamarind in water for 15 to 20 minutes, and extract the juice. Add all the fried seasoning (Steps 11 to 14), and sambar powder to the tamarind juice and boil. Next add carrots, and the ground nuts, and continue boiling till the carrot is soft. Now add the cooked dal and continue to simmer, and follow the rest of the steps from 19 to 21! Enjoy the quick, tasty and flavorsome carrot and peanut cooker sambar! Have been extolling the virtues of cooker-sambhar (quickly done,no wastage of fuel, preservation of nutrients etc etc) to all and sundry. Now most cousins-in-law are converted !!!!! This looks delicious.. have never tried this way.. will do for sure..
Thx soo much for posting the recipes, love ur recipes. I want to try this recipe & have a doubt...In this sambhar the peanuts used are the dried ones or the fresh ones, dayavittu clarify maadi. 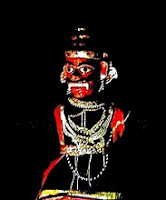 Vandanegalu. Hello Aruna - Thanks for visiting! You can use either really - as the peanuts will get cooked. The fresh groundnuts will be softer, and the roasted ones, with peels removed will have more of a 'bite' to them. This is so good! I could eat it for breakfast, lunch and dinner. I have no experience with Indian food other than restaurants and what I have learned through books. Now I mosty only cook Indian recipes. I used half of the chillie powder in the sambar powder because my grandson (now two) loves this food and always wants "more bite" of whatever I'm eating. Thank you so much for this wonderful recipe!